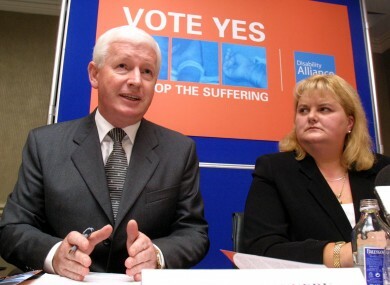 THE PUBLIC ACCOUNTS Committee is to immediately seek powers to compel former Rehab CEOs Angela Kerins and Frank Flannery to appear before it to answer questions over controversies surrounding the disability organisation. Kerins and Flannery wrote to the committee through their solicitors criticising the PAC’s conduct in examining matters related to Rehab. Both former chief executives failed to appear before the committee last month. PAC is investigating a wide range of issues, including governance, salaries and pensions at Rehab. McGuinness said it was “clear from the tone” of the letters that the pair do not accept that PAC has a right to examine the way Rehab spends some €95.5 million in public money every year. The PAC has drafted a letter applying to another Dáil committee, the Committee on Procedures and Privileges, to seek powers to compel Flannery and Kerins to appear before it. The letter is currently being examined by the committee’s legal advisor before it can be approved by members. The application letter could be sent as soon as this week. Sinn Féin’s Mary Lou McDonald said that the letters received by the committee last night “throw the kitchen sink at the committee” and are designed to “stall and delay” its work. Shane Ross said there are a “contrived tissue of allegations” in the letters. Fianna Fáil TD Seán Fleming said the claims in the letters are “a disgrace”. Fleming said he rejected “out of hand that at any stage I abused my powers” on the committee. The meeting also heard that public bodies that provide funding to Rehab have said that other than data protection issues and commercial sensitivity there is “no legal impediment” to the providing information to the PAC about the money they distribute to the organisation. Email “Angela Kerins and Frank Flannery to be forced before PAC after they 'throw kitchen sink' at committee”. Feedback on “Angela Kerins and Frank Flannery to be forced before PAC after they 'throw kitchen sink' at committee”.